Morgan horse; photo by Molly Goossens on Flickr (noncommercial use permitted with attribution / share alike). 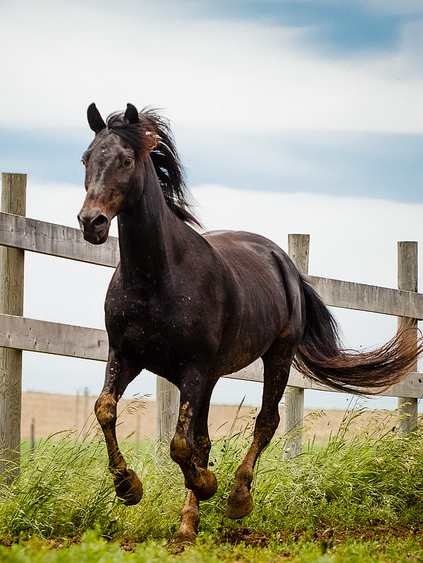 Many other states have adopted horses as official state symbols: racking horse (Alabama); Appaloosa (Idaho); thoroughbred (Kentucky and Maryland); Tennessee walking horse (Tennessee); Nokota horse (North Dakota); Missouri fox trotting horse (Missouri): Colonial Spanish mustang (North Carolina); Florida cracker horse (Florida); "the horse" (New Jersey); marsh tacky (South Carolina); American Quarter horse (Texas); and the Morgan horse is also a symbol of Vermont. Horse symbols have been proposed for Oregon (Kiger mustang), and Arizona (Colonial Spanish horse), but have not yet been adopted. Morgans (Equus cabullus morganensis) are descendants of "Figure," a sturdy little bay stallion owned by schoolteacher and singing master Justin Morgan of West Springfield, Massachusetts. Born in 1789, and later known by his master's name (Justin Morgan), this horse outran and outworked any horse that was brought against him. The horse Justin Morgan became a legend in his own time and beyond. Justin Morgan worked as a farm horse, hauled freight, won pulling bees against bigger, heavier horses, won races over racehorses, and was still considered stylish enough at age twenty-eight to be used as the mount for President James Monroe in a Vermont parade in 1817. The 1945 children's book "Justin Morgan Had a Horse" by Marguerite Henry was published in 1945 and is still in print today. The book was adapted into a Disney film released in 1972. In 1821 the gallant little horse died at the age of 32. Justin Morgan became the foundation sire for the Morgan horse, considered the first American breed and still popular in the United States and around the world. Every Morgan horse registered today can be traced back to Justin Morgan. The Morgan breed is famed for its intelligence, beauty, gentle temperament, and versatility.